I'm going to have to say that this was one of the most pleasantly surprising loaves of bread I've ever made. It looks so modest. Nothing studded or swirled inside. Nothing bursting from the top. But once you've sliced into it, you are met with a gorgeous crust and a soft inside. The flavor is both tangy (from the sourdough starter) and mildly sweet (from the honey). It made perfect toast and amazing sandwich ends and was my favorite way to start the day for the three days it lasted. Sweet yet tangy...very addictive flavor. Would make an amazing cinnamon-raisin loaf. 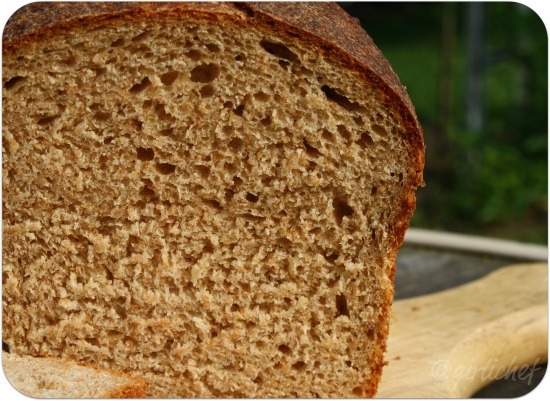 Not what you typically think of when you think sourdough...but so much flavor and depth for a softer bread! 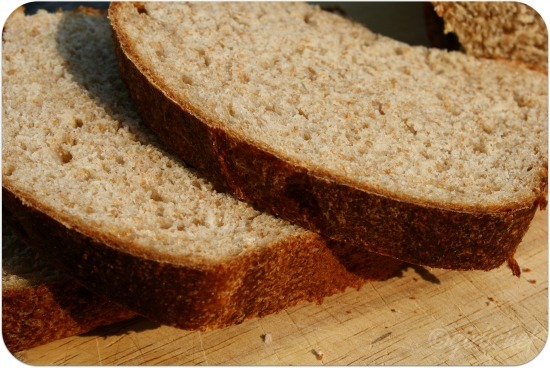 Mildly sweet and tangy, this soft sourdough loaf makes the perfect sandwich bread. Mix all of the ingredients except the salt together, then turn out onto a lightly floured surface and knead for 2-3 minutes. Cover with plastic wrap and let rest 20 minutes. Press dough out a little and sprinkle a the salt over it; knead it in and continue to knead for about 5 minutes longer. Dough should be soft and silky. If it seems too sticky, sprinkle on a bit more flour at a time, but not so much that it becomes stiff and dry. Form the dough into a ball and place it in an oiled bowl, cover again with plastic wrap and let it sit at room temperature until it has almost doubled in size, 3-4 hours. 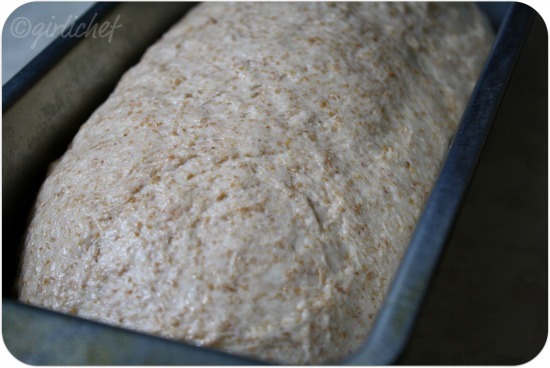 Press out the dough and roll it into a cylinder, then place it in a greased bread pan. Cover again and let rise another 2-3 hours at room temperature or until almost doubled in size. Preheat oven to 400° F during the last 15-20 minutes of rise time. 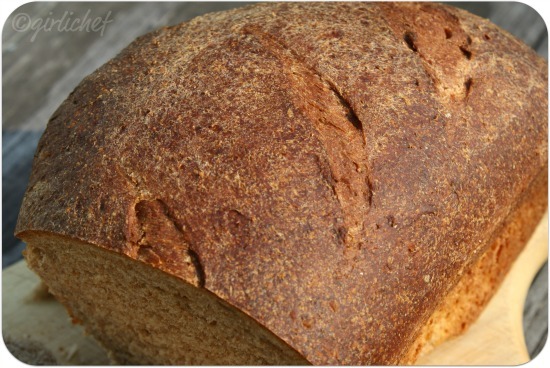 Before sliding into the oven, slash the top of the loaf with a serrated knife or a lame. Spray the loaf with a bit of water (in a misting spray bottle), then slide into the oven. Bake for 30-35 minutes or until golden brown. ©All Roads Lead to the Kitchen. Inspired by and adapted from Teresa Greenway Discovering Sourdough. So perfectly done.. love the brown color..
Looks wonderful. I need to explore your starter and get on the bread bus again! I've been meaning to get back to baking bread at home. Thank you for motivating me! this sourdough fear has got to go! That bread just looks too good! I LOVE sourdough. I'll have to give it a try. Prefectly baked loaf looks super fabulous.. It looks like a perfect loaf of bread. 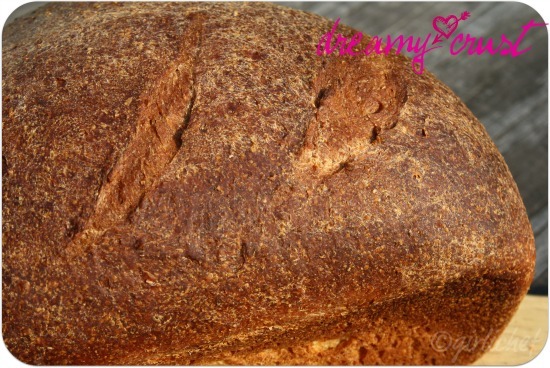 I love sour dough and have to give this a try. Looks like the perfect loaf of bread! One of my fab bread for sandwich. It looks so perfectly baked.. gorgeous. I think bread should be modest. It's the staff of live and the base of so much wonder. Interesting and lively with the honey. oh, if only i had the guts! this looks amazing...and i love the addition of honey. your bread making is becoming legendary my friend. thank you for sharing with tuesday night supper club! Question: can you make this will all white flour? Did you use evaporated milk, dry, or cow's milk for this recipe? Thanks. I use cow's milk (either whole or 2%).